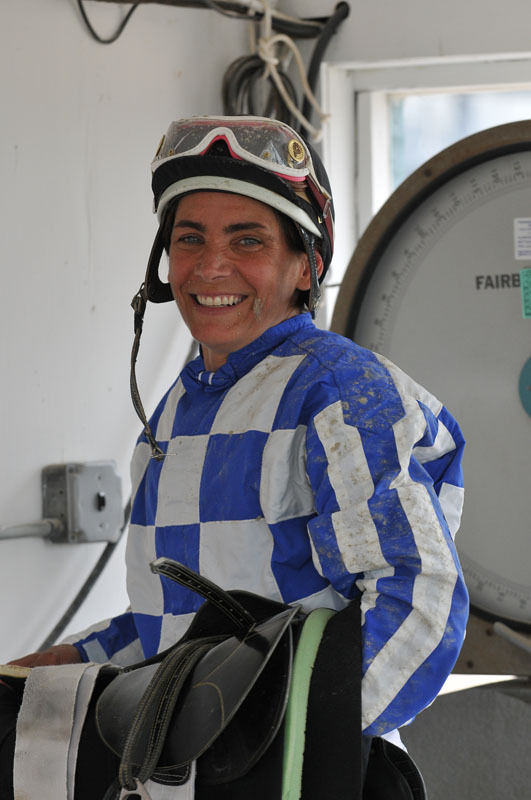 Just four weeks after giving birth by cesarean section, top Suffolk Downs jockey Tammi Piermarini rode to victory on Opening Day this year—three times. On that sunny afternoon, with her long hair streaming behind her, Piermarini won the first race of the May 15th opener, and set the pace for a great season. With 53 victories so far, she is in contention to become the most winning jockey at Suffolk Downs this year. And still, she’s humble about it. At 43, the racing veteran has over 1,800 documented wins to her credit, but has withstood some daunting challenges along the way, including a major illness in 1994 and a serious accident in 2008. So after taking off the winter for her recent pregnancy, she was eager to get back to work. Never one to let inconvenience get in the way of doing what she does best, Piermarini taped her incision and wore supportive underwear, then went on a low carbohydrate diet to make weight. Two weeks after delivering daughter Sophia-Lawren Roseanne to the world, she was back at the track, breezing horses. By adjusting her riding style to allow them to drop their heads and lessen the risk of pulling against her, and ultimately her incision, she rode six horses her first day back. Chuckling, she notes, “Women are told not to even drive a car for six weeks” after childbirth, she says. But, she knew her capabilities, and she wasn’t afraid. Now well into the racing season, Piermarini took time out to discuss her career, motherhood, and the fortitude that has allowed her to bounce back after injuries and setbacks. Asked about whether she saw herself as a “brave” person, Piermarini clearly doesn’t think in these terms. “When you’re a professional athlete, and this is your job, you just get back to work,” she says. But her “work” is also a lifetime passion. Growing up with an equestrian mother, Piermarini started off riding saddleseat and going to horse shows like many little girls. In order to get her own horse, she took a job babysitting, as luck would have it, for a family that owned Thoroughbreds. Soon she started riding young horses for that family and pointing toward the dream of becoming a jockey. At age 18, the Salisbury, Mass. 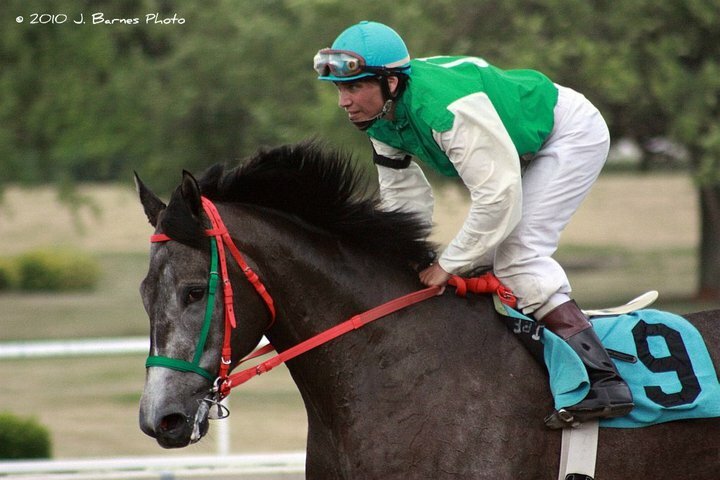 native took out an apprentice license, and started at Suffolk Downs, a track considered to be progressive for its acceptance of female jockeys. 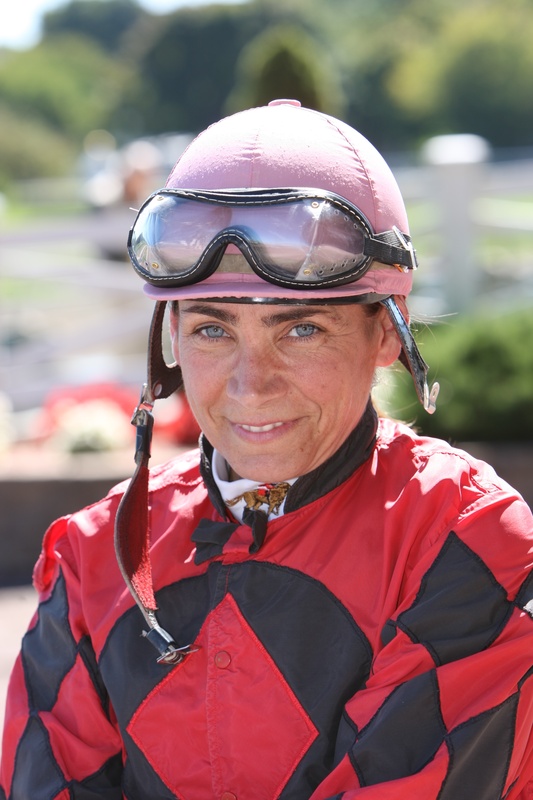 “Boston really likes girl jockeys, and they accept it,” says Piermarini, noting that when she started in the mid-1980s, the track was bustling with top female riders like Jill Jellison, who continues her career at Suffolk, and Linda Anderson, Abby Fuller, and others. 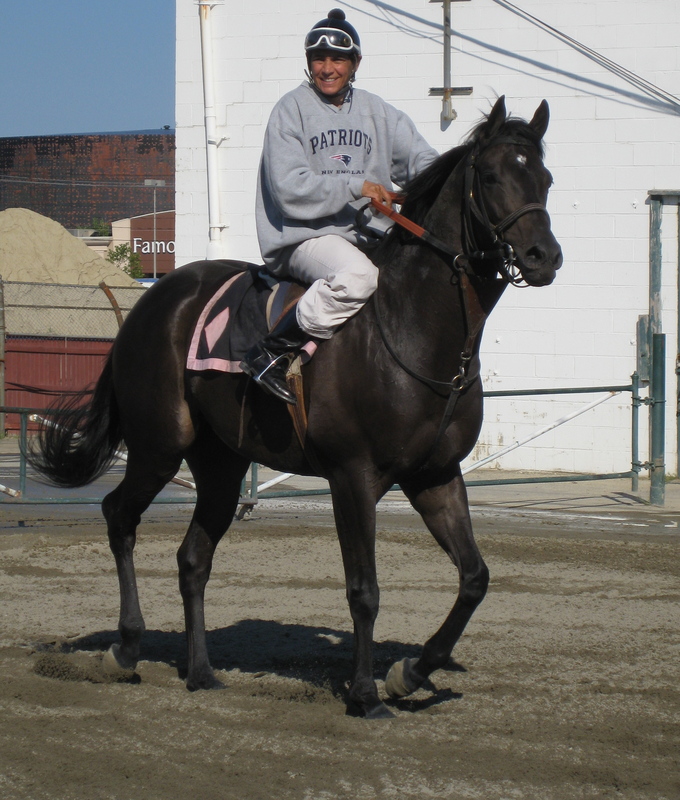 She has won at Aqueduct, Belmont and Gulfstream, and in 2007 was named leading rider at Suffolk Downs. Along the way, Piermarini has faced some tough times. In 1994, while riding a race, she started experiencing severe headaches. By the time she was into her fourth race of the day, the pain was so severe that after winning, she was carried out of the winner’s circle and taken to the hospital. Following a diagnosis of spinal meningitis, Piermarini spent the next four years battling the disease in some form. After rebounding, marrying, and having two children, Izabella and John, she took a serious spill in 2008 and was knocked unconscious for seven hours and was unable to walk for three days. But for Piermarini, there’s no falling back. On the track as in life itself, her focus is always set on what’s ahead. That’s why you’ll find her in the winner’s circle in both. Very good article, nice to learn more about her. Your wife gives girl riders (of all levels) the chills. Just amazing.